17 Things You Didn’t Know About The Thanksgiving Day Parade! Now that Fall is in full swing, it’s time to start preparing for New York City’s greatest Autumn traditions. While I hate to be like a department store and jump the gun on the holiday season, I have to say, there is truly no greater or more iconic Fall event than The Macy’s Thanksgiving Day Parade. Whether you’re bundled up in your warmest winter coat watching it live on the streets of New York, or snuggled up in your pajamas as the smells of a home cooked meal slowly creep into your TV room, the parade brings out the inner child in all of us. With appearances from beloved cartoon characters of past and present, performances from international sensations and Broadway stars, and a feeling that lets you know it’s the most wonderful time of the year, the parade is an American tradition that is as important to some people as the holiday itself. I, for one, have never missed a Thanksgiving Day Parade. I’d make sure my dad woke me up bright and early, every Thanksgiving morning, so I could cozy up and watch the magic. For me, it was a way to see Broadway. For my dad, it was a way to relax before the big game. The parade truly has something for everyone, but I recently realized I don’t know very much about it. I decided to do a little pre-season investigating, and found out the parade has a rich, heartwarming, and at times, hilarious history. Here are some fun facts about America’s favorite parade! The Macy’s Thanksgiving Day Parade was first held in 1924. At the time, it was called the Macy’s Christmas Parade, although it was still held on Thanksgiving Day. The parade was conceived by the employees of Macy’s. Employees. Many were European immigrants, and the traditions of their homeland helped to shape the parade. Until 1927, the parade used real animals rather than the famous balloons. The bevy of beasts included lions, tigers, bears (oh my! ), elephants, donkeys, horses and many more. All of the animals were on loan from the Central Park Zoo! 4. To date, there have been 171 giant character balloons in the parade since 1927. 6. This competition ended due to multiple incidents in which the balloon interfered with an airplane voyage. 7. More than 5 million people attend the parade in New York each year. 8. Over 40 million watch the parade at home. 9. There is an actual job called ‘Balloon Pilot!’They are the 90 or so people who walk backwards while guiding the balloons down the parade route! 10. The balloons take over 90 minutes to inflate, but 15 to deflate. 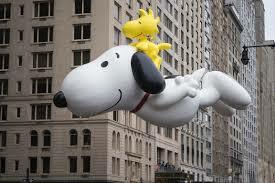 11.Snoopy has appeared in the parade more than any other character. Since his debut in 1968, there have been 7 different Snoopy balloons, and he has made over 40 appearances total. 14. In 1999 the Ask Jeeves Butler because the first internet inspired balloon. Remember Ask Jeeves? 16. The parade is truly a group effort. Taking into account the performers, balloon pilots, Broadway Casts, cheerleaders, marching bands, and countless other participants, there are over 8,000 people working on the parade each year. 17. Almost 1,000 of those participants are clowns. Who knew clowns were such a big Thanksgiving tradition?